Quick thing: I will be choosing the winners of Friday's Deals on Meals give-away this evening and announcing them tomorrow ... so if you haven't entered, go do that now! Another Monday morning ... the weeks and the weekends seem to be flying by. And I know April with it's long weekends is not going to be any different. On Friday, I went out for after-work drinks while Varen had his work farewell (this is his last week, he is thrilled!). Work drinks turned into work dinner and I only ended up getting home after 10pm. Varen arrived about half an hour after me. It was a really nice night, doing something sort-of spur of the moment with a new group of people. I always think it's nice to be able to socialise with the people you spend all day working with. We went to Primi Loft (I can't decide if I like the way they give each of their chain a different name of not). Now I will say that in the past, the thought of going to any Primi restaurant would've sent me screaming. I have never liked this chain. To the degree that if you rated it highly I probably wouldn't take restaurant recommendations from you. I'm glad to see it seems to have changed somewhat and it wasn't as dreadful as I remember. The cocktails were delish (Mojito's!) and I enjoyed my very average California (with Bacon) Pizza. On Saturday morning, Varen & I went racing around to a few large pet shops to see if we could find a new giant hutch like the one I set my heart on last week. Or if, at least, I could find someone who could build one to my specifications. No such luck in Joburg so far, would you believe? I guess garden-carpentry isn't really big on online advertising (really, I have no idea what to call it which may be why I'm having no luck searching online!). The only place I've found so far that looks decent enough is in freaking Gordon's Bay :( But I've sent the guy my design and we'll see how much it's gonna cost ... including shipping all the way here :( I expect it'll be a fortune! Anyone know of someone they can recommend with the sort of woodwork & wire skills I need?!? Please ... ? A little later I headed off to The Secret Garden for March's bloggirls lunch :) The company was great (with Jackson's Mom, Louisa, Jenty and finally, Boldy Benny who joined us for the first time, who I have been dying to meet IRL!) but the restaurant was just average in my opinion. It must be great if you have kids tho and Connor & Jackson who tagged along will attest to that, I'm sure. I will say it was lovely being outside on a lawn on such a beautiful afternoon instead of cooped up in a restaurant. 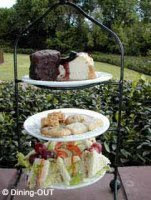 The service isn't great, and the High-teas were fine enough - nothing very special in my opinion tho. And then after plenty of girl-chatter, it was back home to Varen. We didn't really have plans for the evening and I wasn't really sure if we were going to do Earth Hour or not, but we decided to. Especially after Jenty gave me a wonderful suggestion to spend it in the garden on a blanket with a bottle of wine, which is exactly what we did. I will say I was disappointed. I expected to notice a difference. Our complex didn't appear any different than any other Saturday night ... other than us, the only people who seemed to be participating were those who weren't actually home! Even the complex didn't switch off the walkway lights! And our participation "picnic" was ruined by the screaming rugby-boys a few houses up. Their racket was quite unpleasant. This is so truly what I hate about complex-living. Having other people inflicted upon you when you're trying to enjoy some time in your garden. So yeah, I was not impressed. Sunday was lazier. We got the week's shopping out of the way and finally got round to watching Slumdog Millionaire in the evening. Jamal Malik, a penniless 18-year-old orphan from the slums of Mumbai, is one question away from winning a staggering 20 million rupees on India’s “Who Wants to Be a Millionaire?” But when the show breaks for the night, suddenly, he is arrested on suspicion of cheating. After all, how could an uneducated street kid possibly know so much? Determined to get to the bottom of Jamal’s story, a jaded Police Inspector spends the night probing Jamal’s incredible past - from his riveting tales of the slums, where he and his brother, Salim, survived by their wits, to his hair-raising encounters with local gangs, to his heartbreak over Latika, the unforgettable girl he loved and lost. Each chapter of Jamal’s increasingly layered story reveals where he learned the answers to the show’s increasingly challenging questions. I still think you should have tried the chocolate cake. Oh and I'm not sure if you've found a bunny hutch maker yet - but I forgot to give you my friend's number on Saturday. He builds cupboards and what not, very good quality - even my dad the engineer agrees. So if you're still looking I'm sure he could whip something up for you if you have an idea of what you want. His name is Christo and you can get hold of him on 072 242 3861. @louisa - thanks for the details. Am waiting for a quote to come back ... and then I might be calling your friend ;) Haha.